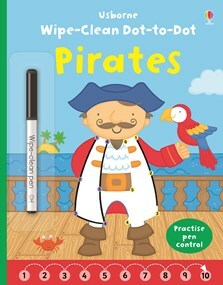 A wipe-clean activity book, full of fun dot-to-dot pirate puzzles for little children to solve. Children can join the ten numbered dots to reveal each picture, including a pirate crew, a treasure chest and a pirate ship. A fun activity that helps preschool children develop pen control and counting skills, and with the wipe-clean pages and special pen, they can practise again and again.